From courtrooms to council meetings, the right to speak freely and be understood is fundamental. Listen Technologies offers a range of solutions with high-quality sound and privacy to make it easy to focus on what’s important. Explore options below for Government. Download this white paper to better understand the specific requirements of The Americans with Disabilities Act and new legislative compliance requirements for assistive listening. 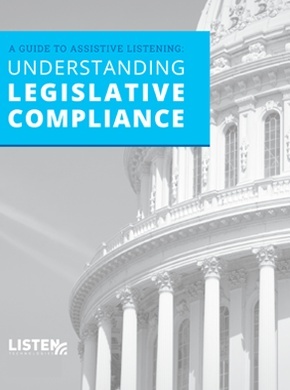 Download this white paper to better understand the specific requirements of The Americans with Disabilities Act and new legislative compliance requirements for assistive listening. Fill out the form below for instant access. The Digital IR system with 25 receiver units allows for hands-free listening and seamless toggling between six crystal clear channels. The IR system is highly efficient and offers unparalleled security and signal stability in a noisy, well lit space. We plan to expand our system to 50 receiver units.